Age: 15-17 (Outer)Birthday: May 8 (Outer)Zodiac sign: Taurus Height: 166 cm Weight: 47 kg Three sizes: 86-56-86 (outer), 90-58-88 (inner) Moka is a student of the Yokai Private Academy. She's the first person Tsukune met when he first set foot on the monster realm. Moka's true form is a vampire but she is very sweet and kind. She takes a liking to Tsukune after sucking his blood and seems to get addicted on doing so. 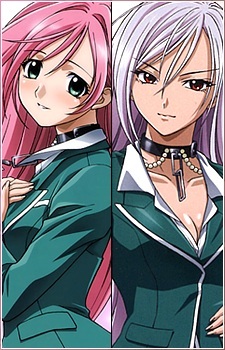 The reason Moka wears a rosary around her neck is due to her 'inner self'. When her rosary around her neck is removed (to date Tsukune is the only one capable of removing it), the seal that was keeping her true nature is released. A few physical changes occur, signifying her transformation into a super vampire. Her hair turns silver, her pupils turn to slits, along with a corresponding flash of light. More important than any superficial change, Moka's inner personality rises to the surface. Cold and bloodthirsty, the 'inner' Moka is actually a completely different entity from the 'outer' Moka, even going so far as to specifically remind Tsukune to 'be kind to the other Moka'. Moka is also one of the most popular girls around the school so she gets a lot of attention around the guys, but she pays them no attention with the exception of Tsukune (much to the guys' dismay). Moka is an excellent student, ranking 13th overall on the school exams, and also a member of the Newspaper Club. Moka is afraid of water, the reason being the purifying powers of water have an adverse effect on Vampires, hurting them as well as rendering them unable to properly function. It's revealed in an omake that she loves tomato juice, but prefers Tsukune's blood.